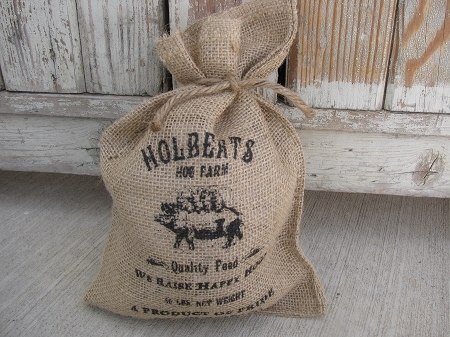 Primitive Farm Fresh Burlap Holberts Hog Farm Burlap Feed Sack. Feed sack decoration. I've taken these printed burlap sacks and stuffed them to look full and tied them up with jute. Great decor piece for cabinets, baskets, crocks, and more. Size is 10" x 8"